Our family is big on History. VERY big! In fact, most of our homeschooling revolves around whatever period of history we are currently studying. Great history resources are essential to our successful homeschool. 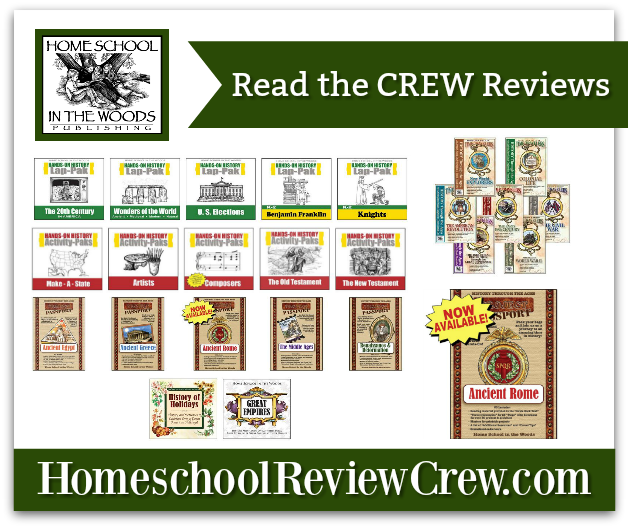 We’ve been big fans of many of the products offered by Home School in the Woods for quite some time. Our history studies lately have been solely focused on the Project Passport World History Studies. These days we’ve been making our way through Ancient Greece. This study (like all Homeschool in the Woods programs) is probably one of the richest hands-on history projects on the market. Not only is it beautiful, but it’s also bursting with so much learning. When you complete this study your family will use lapbooking materials, built in reading materials, audio recordings, and so much more. In fact… I’ve got to be very honest. While there is an abundance of resource, projects, and materials that it can feel a bit overwhelming at first…everything is so well organized. This is a digital downloaded projected intended for children in grades 3-8. I love how easy it is to group my three biggest children (ages 8-12) together to work through these projects. I do feel like younger children can join is on certain parts too. It’ll be up to you to pick and choose what projects will fit each of your children. To prepare for this study you’ll find there is a lot to the download. Pay close attention to the provided instructions and do give yourself some time to get acquainted and prepared. After a couple of lessons, you’ll have the hang of it and it’ll be very easy. With every Project Passport study, including this one on Ancient Greece, it is as if you and your family are embarking on a trip through history. You begin by completing passports and luggage folders. Over the course of the study (which usually takes us 3-4 months to complete), you move through 25 “stops” (lessons). Each stop will focus on a different aspect of life for the Ancient Greecians. You’ll study agriculture, trade, sciences, arts, architecture, religion, government, poets, and many great wars, warfare, heroes, and leaders… and the list goes on and on. At each stop, you’ll find a couple of pages of reading filled with detailed information. The reading lays down the foundation for the activities that come after. Often the reading will come from a Christian point of view and bring in a Biblical message. The reading makes life easy for you, the teacher. You don’t need to spend time and effort tracking down extra books or other resources. You don’t need to read through several books to find just the information needed for that lesson. What you need is RIGHT THERE. When we complete one of these studies I do usually make a library trip and come home with a haul of books on the topic. Books do enrich the study, especially if they are full of pictures. The glory is that they aren’t necessary. At the beginning of the study, you and your children will create a binder you’ll call their “Scrapbook of Sights.” This is where they will keep EVERYTHING. Here they’ll place their timeline, maps, postcards (from important historical figures) and more. There are over 50 projects for you to complete together. Two projects that span the length of the study include creating a lapbook – which we store in the Sights and Sounds binder and writing a newspaper to report on your adventures. To complete these projects you will need to be prepared with paper, cardstock (colored and white), glue sticks, markers, clay, string, and other similar materials. Read ahead so you can keep your supply closet stocked. Personally, my favorite part is the audio recordings. These are dramatized and take you on something of a tour on the land. There is over an hours worth of listening material here. It all just adds so much depth and richness to the study. Keep in mind that this program is incredibly flexible. Your family can choose to do a lot or a little every week. Take as long or as little time as you need to complete it. Do all of the projects or just pick and choose what works best for your children. There is so much more to this product than I have room to write about. The timeline alone is just absolutely stunning and one of our favorite components. We are thrilled to keep plugging along and finishing up all 25 lessons. I highly highly recommend anything from Homes School in the Woods. I am so excited to see that Ancient Rome is now available from the Project Passport World History Studies! Now the complete series download of Project Passport Collection is available.